The Assassin’s Creed series has been going strong since the first game hit shelves back in 2007, although many fans of the franchise were likely not pleased with the fact that no major entry in the series came out in 2016. It’s not hard to figure out why Ubisoft chose not to launch a new Assassin’s Creed that year though, with a major motion picture based on the series coming out and the Assassin’s Creed Chronicles games hitting shelves as well, Ubisoft made the wise decision of letting the development team at their Montreal studio take their time to polish the next Assassin’s Creed. And this extra development time has surely paid off, as Assassin’s Creed Origins is definitely the best entry in the franchise since 2013’s pirate-themed instalment, Assassin’s Creed IV: Black Flag. There’s also no trace of the stability issues and crashes that plagued the earlier Assassin’s Creed Unity, and Origins is largely stable and bug-free, with the game only crashing on me once during my playthrough (I also encountered a few sound issues which Ubisoft appears to have largely patched by now). Perhaps the biggest draw of this game is its ancient Egyptian setting, and thankfully this is one of the most beautifully-realised settings in the Assassin’s Creed series to date. The huge statues, temples, pyramids and obelisks you would expect to see in a game set in ancient Egypt are present and correct, as this surely is as great a recreation of ancient Egypt as you could hope for. This Assassin’s Creed game also boasts fantastic graphics, with crisp textures (that stonework on the game’s ancient Egyptian statues looks so real you can almost touch it), realistic water and smoke effects, and great lighting and shadows that help make this game even more atmospheric. While playing the game you might even take a break to admire the beautiful scenery, and I found myself taking screenshots frequently due to how unbelievably gorgeous this game looks. The draw distance is vast, with Ubisoft not skimping when it comes to faraway detail here either. Actually, the amount of detail is staggering, and it would not be an understatement to say that this is the best-looking game of the year on PS4 (which is the version I played for this review). 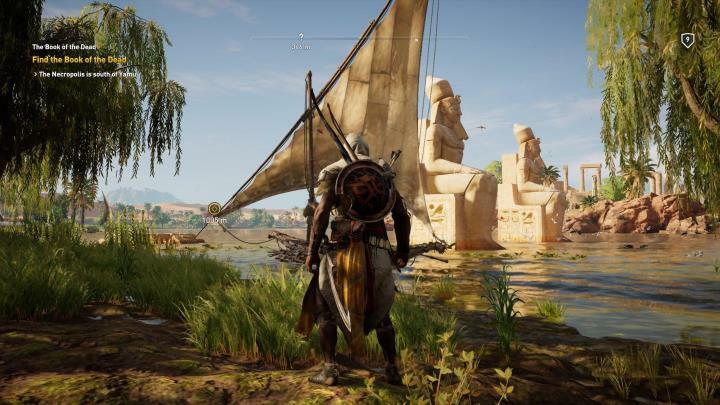 Assassin’s Creed Origins might not be as good as booking a sightseeing trip to Egypt then, but it surely does come close. But no matter how good this game looks, it would not be worth your time and your money if the gameplay was not up to par. So how does Assassin’s Creed Origins actually play? Ancient Egypt looks fabulous in this Assassin’s Creed game. The biggest novelty here is that Assassin’s Creed is a fully-fledged RPG now, and protagonist Bayek gains experience points as you progress in the game, levelling up and gaining new abilities. You get to choose which abilities Bayek gains on a screen in which you can spend your hard-earned ability points. Some abilities only require you to spend one ability point to unlock (for example, one which lets you equip a second bow) while others require more ability points to unlock. Not all abilities are that useful, though, and one which granted me the use of sleep darts I was hardly able to make use in combat, although others such as one which speeds up the passage of time until dusk (or dawn) is almost mandatory if you don’t want to spend your time waiting to complete certain quests. You get experience points and hence ability points by completing quests, and aside from the main story quests, there are plenty of side quests to tackle in this Egyptian adventure too. Like in most role-playing games these days, quests have a suggested level, and you will keep finding quests that challenge you all the way to the end, which is a good thing in my book. Of course, you can attempt a level 30 quest even if your character is still stuck at level 22, and since every single objective in a quest is spelled out for you and marked on the map and you can also continue any quest right where you left it, you can always come back when you’re stronger and finish any quests you found too difficult earlier on. Some quest objectives, though, require that you search a specific area to locate a target, and for this you can rely on your trusty eagle Senu. You can switch to Senu at any point in the game to get a bird’s eye view of the landscape, and also to pinpoint the location of quest items you are searching for. Regarding the game’s quests, it is also a good thing that quest rewards are explicitly stated (how many experience points you get and other rewards like special items you get for completing the quest), so you know exactly whether a quest is worth your time and effort before you take it on. Assassin’s Creed Origins’ quests can sometimes get repetitive though, and end up blending into one another due to how similar quest objectives are at times. Because the truth is that many quests do follow a similar template, involving the rescue of a prisoner from an enemy camp, recovering a certain item for its owner or killing a specific enemy hiding in some well-guarded installation. The citizens of ancient Egypt have plenty of quests to offer in Assassin’s Creed Origins. At least there’s an interesting story behind most of these quests, such as one in which you go after a group of bandits who have poisoned the local water supply, and another in which you search for a wife’s missing husband who has found himself trapped by crocodiles in the middle of a lake. And some of these quests are truly original and interesting, like one which requires you to deal with a group of bandits in the desert in order to retrieve a stolen cart (tip: stealth is the key here), and later look for ancient hieroglyphs which reveal the location of a long-lost temple. Also welcome are the new crime scene investigations, in which protagonist Bayek has to figure out what happened at the scene of a murder or another misdeed by examining clues. These sequences are similar to those seen in Rocksteady’s Batman Arkham games, or 2015’s superb The Witcher 3, and you also get to see a recreation of the events that took place at the crime scene in some cases, which is a nice touch. You can also visit merchants in the game’s towns and cities in order to buy new gear and get hold of some cool weapons, although I found plenty of gear throughout my adventures in ancient Egypt that I never really felt the need to purchase new ones at merchant shops. And truth be told, there are loads of weapons available in the game, from bows to spears, although I tended to stick with a few weapons throughout my playthrough and sold the rest, although you can still upgrade your favourite ones at merchants if you so desire. There’s certainly a lot to see and do in Assassin’s Creed Origins ancient Egypt, then, even if not all of the game’s new features work so well. A case in point is the game’s new combat, which despite being billed as a big improvement by the game’s makers, does have some issues. This are mostly due to the fact that you won’t hit enemies with your sword automatically like in previous Assassin’s Creeds, but need to be aware of the distance between you and the enemy at times, as this game doesn’t feature a “paired” combat system like the earlier games. This led to some frustrating situations during my playthrough, as after knocking down enemies with an overpower attack I sometimes couldn’t manage to hit them while on the ground, as you need to aim precisely at the spot they are lying on (the game doesn’t do this automatically for you like in the earlier entries in the series). Combat is challenging and fun, but has its issues though. Also, the way in which protagonist Bayek handles enemies before acquiring the Assassin wrist blade is slightly annoying. This is because when stealthily taking down enemies early in the game, Bayek won’t kill them outright, but instead leave them moaning in pain on the ground, attracting the attention of their comrades. I almost always ended up finishing them off with my sword, and this whole process felt slightly awkward. Thankfully, this annoyance disappears once you get hold of the famous Assassin wrist blades, letting you assassinate enemies silently instead of taking them head on in combat. And taking the stealth approach is often a good course of action, especially if you are facing enemies that are of a higher level than your character (an enemies’ level appears over its head in the game, and this applies to animals like crocodiles too). Employing hit and run tactics is advisable in this case, letting you deal with powerful enemies you might not be able to fight toe to toe. Plus, like in earlier Assassin’s Creed games, haystacks and carts filled with hay abound, and it’s also possible to hide in bushes and grass in order to ambush unwary enemies. Setting up ambushes is also made easier by the fact that the game lets you see enemies’ silhouettes through walls and other obstacles, making it easier to get behind opponents and deal a fatal strike. There are other noteworthy improvements to combat too, such as the fact that you get to see how much damage you would do to an enemy before shooting an arrow, as he might be able to alert his comrades if you are not able to kill him outright with a well-placed shot. Actually, some enemy camps and forts are really well-guarded, with enemies attempting to call for reinforcements when overwhelmed. Overall, combat in Assassin’s Creed Origins can be quite difficult, and higher-level enemies will be able to slice and dice you without much trouble. It’s a good idea then, to meet or exceed a quest’s suggested level before taking it on, although thankfully the amount of grinding and side questing you have to do before being able to progress in the main quest has been kept to a minimum here. Regarding the main story, Assassin’s Creed Origins delivers the usual tale of revenge which has been at the centre of every Assassin’s Creed game since the original hit shelves back in 2007. The game’s plot pits protagonist Bayek against a mysterious group known as the Order of the Ancients, and early in the game, it is revealed why Bayek is no friend of the Order in one dramatic cutscene. 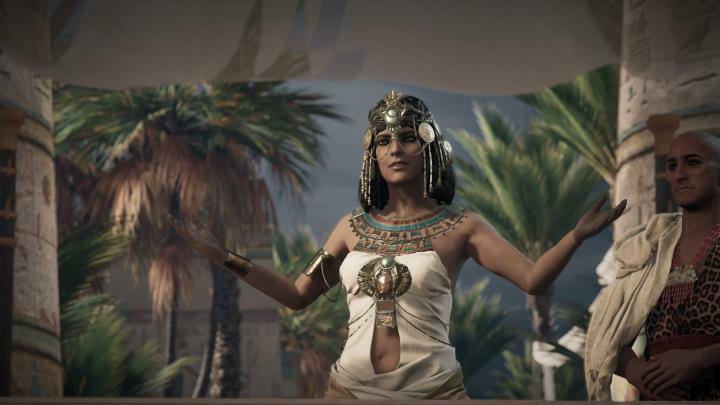 And since the Order of the Ancients also supports the current leader of Egypt (the evil Pharaoh Ptolemy), Bayek ends up teaming up with Queen Cleopatra, who aspires to be Egypt’s new leader and dethrone her brother. Queen of the Nile… Major historical characters like Cleopatra feature in the game’s story. Truth be told, the game’s story is not up to much, and is basically just an excuse to embark on a series of assassination missions in order to take out several members of the proto-Templar order. It’s still interesting to follow, though, as it reveals how the ages-old conflict between the Templars and Assassins got started, while there are some good surprises throughout the story thrown in for good measure. 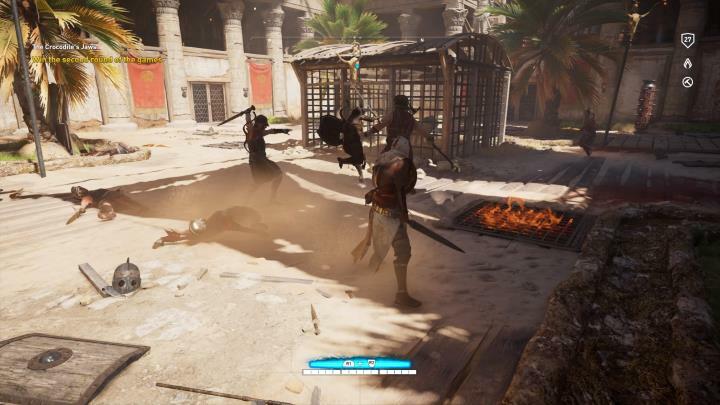 Some of the assassination missions are also great, such as one brutal and exciting one taking place in a bathhouse, which makes it clear how far Bayek is willing to go in order to get even with the evil Order. 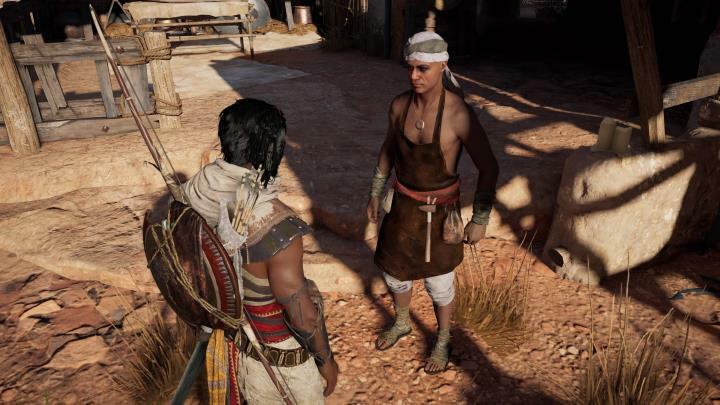 Also, Bayek is a great character, and I would dare say the best Assassin’s Creed protagonist since ladies’ man Ezio Auditore in 2009’s Assassin’s Creed II. He’s certainly no cardboard cut-out, but a fully-fleshed protagonist whom we get to know quite a bit throughout this adventure. 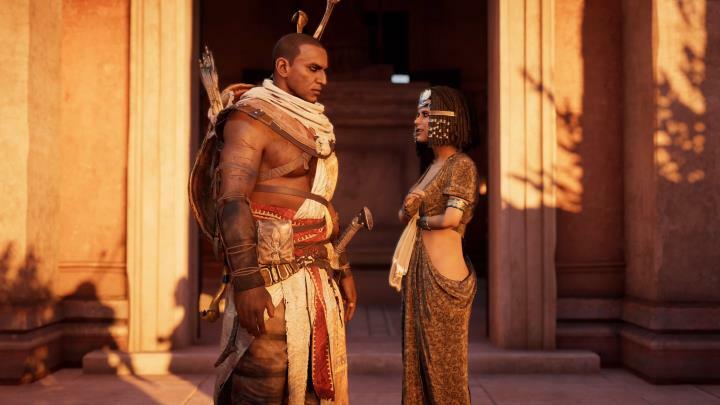 It’s definitely a good thing that Bayek is such a great character, though, because the rest of the game’s characters, except historical ones like Cleopatra and Julius Caesar, and Bayek’s wife Aya, are not that great or memorable. Truth be told, I would have trouble naming any of the villains I had to dispatch throughout the adventure, even if I definitely had a great time doing so. The game also benefits from a haunting musical score by Sarah Schachner, which will certainly enrich your gameplay experience, even if it doesn’t always fit the action onscreen perfectly. And like other Assassin’s Creed games, Origins also boasts a playable modern-day section, and although enjoyable, this ends up feeling like filler and doesn’t add much to the story, and certainly isn’t comparable to the modern-day story in earlier games like Assassin’s Creed Brotherhood. In the end though, Assassin’s Creed Origins is more than the sum of its parts, and despite a few flaws this is still a great action and adventure game all around. Actually, Origins is a great return to form for one of the most loved franchises in gaming, and I definitely cannot wait to see where Ubisoft will be taking the series next. For the time being, though, it’s clear this is one of the best games the series has delivered to date, and a must-play title for Assassin’s Creed fans for sure.